Home » Everyday , Health » THIS IS HOW TO GET RID OF PESTICIDES AND BACTERIA IN PURCHASED FRUITS AND VEGETABLES! When buying fruit and vegetables, there’s no better option than organically grown produce. However, trusted sellers are hard to find, and organic food does tend to cost more than food that’s grown in a conventional way. So, we often end up having no other choice than the produce on supermarket shelves. 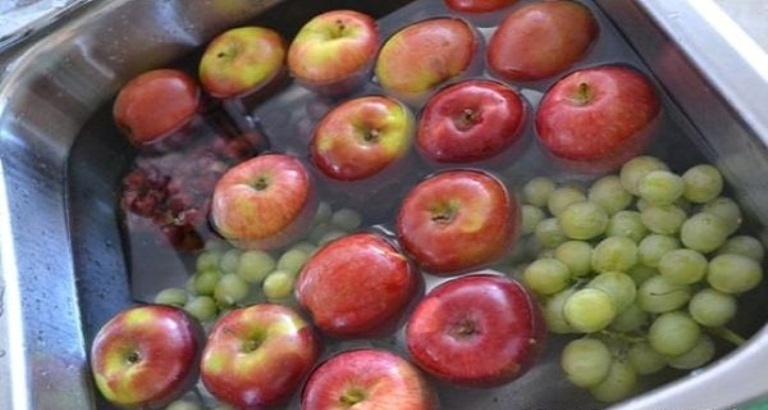 A simple home trick can help you remove all pesticide residues from your store-bought produce. All you need for this is some water, apple cider vinegar, lemon juice and soda. Take a small bowl and mix a cup of water, a cup of apple cider vinegar, a spoonful of baking soda and two tablespoons of lemon juice. Let the mixture blend well before transferring it to a clean spray bottle. Next, spray it on your fruit and vegetables. Let it act for five minutes then wash your produce thoroughly. You can apply the same method on herbs and stems, if the fruits and vegetables have one, because pesticides and bacteria are often transmitted when cutting these foods .